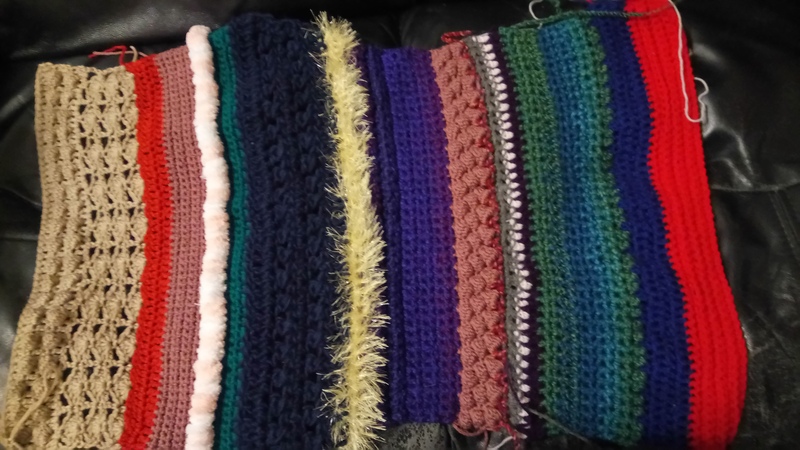 Twiddle muffs are some times used to help people with dementia, Alzheimer’s disease, autism or learning difficulties. The textures & embellishments give them something to do with their hands, distracting from picking at their skin or pulling at medical equipment and bandages. They are constructed as a muff rather than a blanket as they can be slipped onto an arm with less chance of being dropped. I was asked to make one a bit before Christmas; at the time I was in the middle of my Christmas Stocking mountain so this week was the first chance to have a go. I had never made one before but I have seen them and I knew the basic theory. You need a tube that is large enough to fit both hands inside comfortably, so I aimed for approximately 30 – 40 cm long and 20 cm wide when laid flat. A variety of textures is best using different blends, weights & textures of yarns. I raided my oddments bag, begged a few different yarns off a friend and also bought some tinsel and pompom yarn while at the Wool Haven. The colour mix may not be the most subtle but I thought a selection might be stimulating. I’m not writing out a pattern as such, these tend to be unique depending on what you have to hand. The final rectangle measured 63 cm long and approx 38 cm wide, it’s not very straight due to the changes in yarn weight and stitches. The tube was then folded in half to give a double thickness muff, with the last and foundation rows crocheted together. The project is easy but more time-consuming than I expected. I think it’s taken about 9 hours from start to finish.